Listed below are the details of some of the choirs involved in the Cycle of Songs Project. You will be able to find information about where they rehearse, when they rehearse, their contact details and links to soundfiles, YouTube accounts and official websites. For the Choirs who recorded tracks for the app, we have published photo albums which are available in the relevant Choir sections if you scroll down or click on the relevant name of the choir. You can link to these albums from your Choir websites, facebook accounts etc. Please do use the photos on our flickr site too! 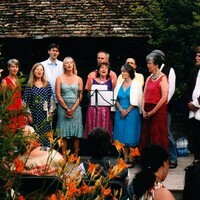 The Cycle of Songs Choir was a free open-to-all-choir that met at various venues and events and was open to singers of all ages, whatever previous singing experience. The songs were taught by ear by Rowena Whitehead, Choral Director for Cycle of Songs Choir & Live Events. If you would like to use the songs for your choir, please find lyrics and recordings of the parts that are available on the Sound Files page of the Cycle of Songs website. Addenbrooke’s Hospital Choiris a community choir based at Addenbrooke's Hospital. 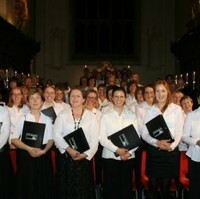 The choir consists of staff, past and present, from departments throughout Addenbrooke’s Hospital and Papworth Hospital. Their performance help raise money for a number worthy causes. Cambridge Music Education Outreach is supported by grants from HEFCE’s Higher Education Innovation Fund (HEIF) and the University’s Active Community Fund. Outreach Officer, Joe Shaw, has developed a portfolio of activities for secondary schools and colleges and primary schools alongside community projects and public events. One aspect of this portfolio is the Choral Outreach scheme. There are several choirs in Cambridge specifically for or which involve children, these include Jesus College Choir, King’s College Choir, St John’s College, St Catharine’s Girls’ Choir, King’s Junior Voices, Phoenix Chorale, Great St Mary’s Church and Little St Mary’s Church junior choir. 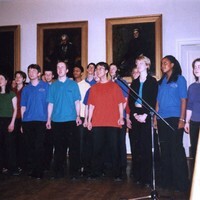 Cambridge Ten Sing is an informal performing arts group FOR and BY young people, with adult co-ordinators. Main activities are singing, music, dance and drama, but also technical stuff. The group is for secondary school students and there is no audition - the important thing is to take part and attend regularly. The young people choose the material they want to work on and have the opportunity to try out new things - conduct, sing solos, play instruments, choreograph dance etc - in a fun, safe and team building environment. The group has 30+ members and welcomes more :) New people are encouraged to come to a 'normal' rehearsal and see if the group is for them before committing. Annual subs are £40 (ca £1 per evening) and there is sibling discount. Chela, the Cambridge Georgian Choir is a choral ensemble based in Cambridge, dedicated to the learning of the unique choral tradition of Georgia. Using the sheet music of an ethnomusicologist named Edisher Garaqanidze, they give voice to polyphonic songs have been passed down from one generation to the next for thousands of years in Georgia. The choir started as a group of friends sharing an enthusiasm for these songs around 11 years ago. Chela is an open choir and learns songs mostly by ear so the ability to read sheet music is not compulsory. Tamta Turmanidze, the leader of the London Georgian Choir, Maspindzeli, currently teaches the choir once a month. Eight of the members of Chela are already part of Maspindzeli choir. Chela also assists in organising concerts and workshops in Cambridge when Georgian choirs visit England. They occasionally perform in churches and halls in Cambridge to raise money for Georgian causes and to support the choir. 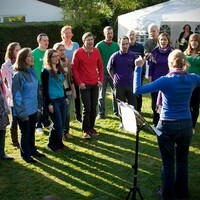 The Dowsing Sound Collective were founded in Cambridge, UK, and are comprised of 120 singers and 20 acoustic musicians. They describe themselves as “Not a choir and not a band, but something somewhere in between.” Their performances are eclectic with a variety of set lists spanning Scandinavian soundscapes, club anthems, indie hits to plainsong and early polyphony. We're undaunted by written notes, yet many of us can't read music. They are open to all and welcome singers of all experiences and backgrounds that can hold a tune, as well as instrumentalists, composers, and musical directors. Global Harmony is part of Talking in Tune’s Musical Director Rowena Whitehead’s weekly drop-in sessions. Held at Ross Street Community Centre on Thursdays between 1.45-3.15pm it offers a friendly singing group for people of all levels of experience. It is designed to develop vocal skills and confidence. Participants sing songs from different vocal traditions which are all learnt by ear with occasional informal performance opportunities available. Each session costs £5.50. Great St. Mary’s has a long history and in its dual role as a Parish church and church to the University of Cambridge it has always attracted musicians from within the University and outside. There are opportunities for singers of all ages to join Great St Mary’s Church Choir. The Junior Choir takes children aged between 5 and 7, is conducted by Helen Groves, professional soprano and singing teacher. 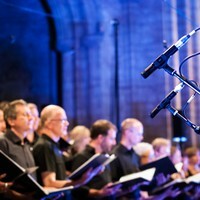 The main choirs comprise a ‘back row’ of altos, tenors and basses, and three independent soprano lines, of boys, girls and a girls’ chamber choir. Places in the younger sections of the choir are open to singers from around the age of eight. Places in the back row are open to keen singers of any age, who share our passion for choral music. 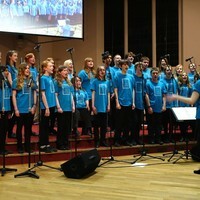 Throughout their time in the Choir, singers learn about music, and receive singing coaching as a group from the Director of Music, Sam Hayes, and individually from Helen Groves. Each of the sections of the ‘main’ choirs may be required to sing at any of the three choral services on Sundays – Parish Communion, Choral Mattins and Choral Evensong, plus other services for festivals and special occasions. Great St Mary’s also has ‘The Occasional Choir’ for adults who enjoy singing but cannot commit to the regular rehearsals required by the main choir. For more details you can contact Sam Hayes, Director of Music via email at music@gsm.cam.ac.uk or telephone 01223 741716. 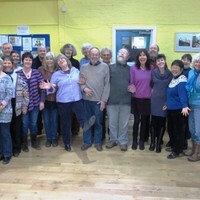 Good Vibrations is Cambridge's very own home­grown open access mixed community choir of up to 40 people. Led by Sue Parlby, we enjoy songs from different global traditions and eras, with everything taught by ear and no auditions. We do several fundraising performances each year often in collaboration with other groups and musicians - with the main focus being on energy and fun. Mondays 7.45pm to 9.45pm during school term times. 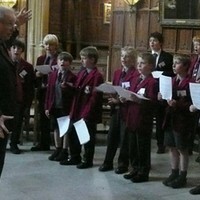 King's Choristers have recorded a new commission for Cycle of Songs. This has been written by Michael Berkeley for King's College Choir, and for this recording the King's boys joined forces with the junior voices from Milton Road Primary Choir - pictured together having fun after the recording session in King's Chapel, showing Michael Berkeley standing to the left of the group of Choristers, flanked by the two choir teachers from Milton Road Primary School. The Milton Road C of E Primary School Choir is made up 65 pupils aged between 7 and 11. They are led by the Teacher of Music, Rebecca Moulton, and the variety of songs they sing are learnt by ear although pupils do also read some music. They have performed at a number of events outside of the school, including performances with King's Junior Voices at King's College Chapel, the Cambridge Big Sing at Great St Mary's Church, Royal Albert Hall in aid of Barnados, and the MFY Regional and National Festival in Birmingham. 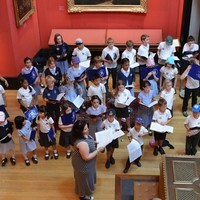 Milton Road C of E Primary School choir learnt songs and were part of the wonderful Cycle of Songs Songfest that took place on the 7th July 2014 at the Fitzwilliam Museum. To find out more about the school you visit their website by clicking here. One 45 minute rehearsal each week. The Milton Road Primary School Choir is a choir made up of 120 singers aged 7 to 11. They are led by class teacher Anna-Louise Lawrence, and any pupil of the school can join as there are no auditions and everything is learnt by ear with lyrics. The rehearsals take place before school in the autumn and summer so children don't have to miss sports that take place at dinner-time. Then in spring the rehearsals happen on a dinner-time for those pupils who can't attend before-school rehearsals. The choir have a large repetoire of songs that cover folk, world music, gospel, acapella, and Disney. 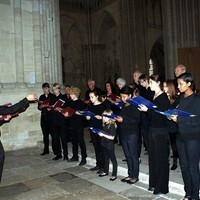 The choir perform at numerous school and public events. These performances include visitor events at the school, a concert every term, the East Anglia's Children's Hospices (EACH) Carol Service, and the annual Sing and Swim charity event, amongst many others. 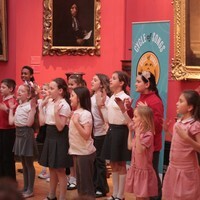 The choir has been involved with a number of the Cycle of Songs events including the fantastic 7th July Songfest that took place at the Fitzwilliam Museum, and they can be heard singing 'Hooray For Hobson' and 'Build This House' on the Cycle of Songs App. "Learning a specially commissioned piece with the music written by Karen Wimhurst was quite a challenge, but won they rose to brilliantly. The whole process of the project has been remarkable - singing in King's Chapel alongside the Choristers for the piece by Michael Berkeley, recording in Great St Mary's and picnicing in their gardens, and of course, serenading the cyclists from the steps of the Fitzwilliam Museum at the Tour de France event. The app leaves a lasting legacy, one where you can walk around the spaces of our city in Cambridge, and hear all these wonderful songs, an adventure in sound." 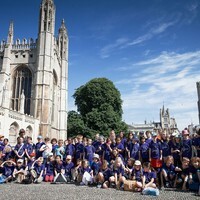 "The Cycle of Songs Project has provided our large school choir with marvellous opportunities to engage creatively and musically with like-minded pupils and adults; it has extended our musical repertoire and enabled us to perform in spectacular settings and in front of a world-wide audience. A truly memorable event!" The choir rehearse once a week from 8:05am to 8:50am during autumn and summer terms. To find out more you can visit their website by clicking here. ReSound is a 30 voice cappella choir for experienced singers. 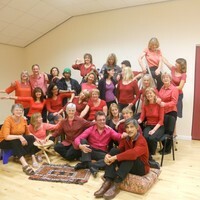 The choir was set up by Rowena Whitehead in September 2010 and they perform regularly around Cambridge, singing an range of contemporary and traditional cappella songs from different cultures, rich in harmony and rhythm. Shout Aloud! is made up of two children's choirs and is a partner project with Church Schools of Cambridge Trust, Romsey Mill and The Church of the Good Shepherd. One choir is based in Arbury and one in Mill Road, both are free and perform a variety of music including pop, jazz, gospel and world music. The choir is open to all children aged between 7 and 11 and the children learn music by ear so the ability to read sheet music is not required. Tuesdays (Arbury Choir) Thursdays (Mill Road Choir) 4:15-5:30pm during term time. Children can arrive any time from 3.30, when they receive snacks and are able to play games. The singing begins at 4.15. Sing! 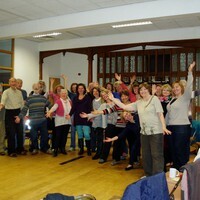 is a community choir based in central Cambridge. It welcomes adults of all ages to come and join them. The emphasis is on “building community and enjoying singing together”. There is no single leader of the choir and anyone who would like to get involved with selecting songs, teaching, conducting, or other aspects of choir practice is supported and encouraged to do so. They aim to create an inclusive environment where members can have as large or small a part as they like. Sing! is free to try and £5 a term if you would like to become a member. The Spinney Singers are a choir made up of any child who would like to take part who is at The Spinney School in Cherry Hinton. Singing is taken very seriously at the school and parents and staff are invited to join in with the choir. Children are not auditioned, the choir is open to all. The team at Cycle of Songs was enormously impressed with the musicianship and eagerness of the Spinney Singers, who learnt the Hobson's Rounds, and Why We Ride. Indeed the entire school not only learnt the songs, but also the story and web resources were used for history classes for 'Hobson's Horses' and geography classes for 'Why We Ride'. The School were very creative in embedding the project in a fun way into the curriculum, giving the children a visceral experience of singing history and geography. All the photos of these events are searchable on the Flickr site here at Cycle of Songs, and tagged as "Spinney Singers" or by date of the event. 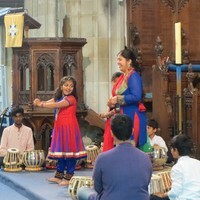 Sur Taal is a charitable music school setup in Cambridge to promote Indian Music and Dance learning among adults and children. Sur Taal is overseen by a committee of Trustees, and regular lessons and events are managed by the Events Co-ordinator. They currently offer Tabla, Sitar, North Indian vocals and Harmonium, Carnatic vocals, & Bharatnatyam, Kathak and Odissi dance lessons. Sur Taal also conducts music workshops and lessons in schools, aimed at introducing the instrumental music to children from all backgrounds, particularly those who may not have had a chance to experience it before. They are a non-profit organisation, with the main aim to make the music and dance accessible to everyone interested, and to facilitate the development of new talent through this activity. Director of Music at Selwyn College, Sarah MacDonald, rehearsed and recorded the ninth piece for Cycle of Songss, written by Selwyn College music student, Alex Cook. This composition was commissioned for the Cycle of Songs by Helen Weinstein, and is called "To Seek a Dream" inspired by the Chinese poem by Xu Zhimo, and scored by Alex for voices, strings, piano, and importantly the Ghu Zheng, the Chinese Harp played by Hannah Brock. The Chapel Choir has led worship in Selwyn since its foundation in the last decade of the nineteenth century. For the first two-thirds of the twentieth century, the all-male choir of undergraduates was directed by the Organ Scholars, and sang daily Choral Evensong. For occasional larger works, the men borrowed sopranos and altos from Newnham College, the women’s College across the road from Selwyn. The mixed choir, formed in 1976 with the admission of women to Selwyn, now consists of up to twenty-eight singers, Choral Scholars (called Choral Exhibitioners) and volunteers, and the choir’s link with Newnham continues to the present day. Most of the choir members are undergraduates or graduates at Selwyn or Newnham, with a few volunteers from other colleges, and they read a variety of subjects including Music, English, Natural Sciences, and Engineering. The choir is conducted by the Director of Music in Chapel, who is assisted by two undergraduate Organ Scholars. During term, the choir sings three services per week in the College Chapel, as well as concerts and services throughout the UK, recently in venues including Westminster Abbey, St Paul’s Cathedral, and St Mary’s Cathedral, Edinburgh. Its repertoire ranges from the 10th to the 21st century. They have broadcast services for BBC Radio, have sung live on television, and every year undertake an international tour (in the recent past destinations have included Israel and Palestine, Canada, New Zealand, the United States, and much of mainland Europe). 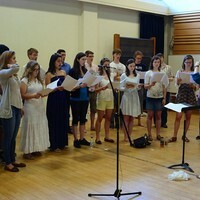 The choir has made several recordings, for labels including Priory, Herald, URM, Kevin Mayhew, and Regent. They were featured as the cover CD on the March/April 2009 issue of 'Choir and Organ' magazine, and their most recent recording, 'God be in my head: Choral works by Paul Edwards', was released in October 2010 on the Regent label. Two further recordings are currently in production. The Cycle of Songs team were thrilled that the Chapel Choir was able to fit in rehearsal and recording for "To Seek a Dream" which will be published on the Cycle of Songs app on 5th July 2014. 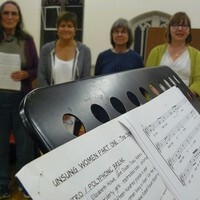 Women of Note is a small, friendly women's choir that meets once a week on Tuesday evenings to rehearse. They were formed more than 15 years ago as an all-women a capella choir and currently have around 20 members. They sing a range of music from modern, traditional, world, to pop, learn by ear and sing unaccompanied. Led by Charlie Thomson, they sing regularly at concerts and events throughout the year. They don’t hold auditions but suggest that people attend a taster session to get a sense of how they run. Tuesdays 8pm-10pm during term time.